The video shows a fisherman in Costa Rica slicing open the stomach of the mahi mahi (aka dolphinfish) and taking out bottle caps, bits of plastic, a mangled comb, and the plastic part of a cigarette lighter. The video has prompted questions: How many animals worldwide have stomachs full of plastic pollution? And why ARE so many plastic caps in our environment? More research is needed to determine the answer to the first question, but studies have frequently shown entanglement, ingestion, and habitat disruption can result from plastic ending up in the spaces where animals live, both on land and in the water. To the second question, a conversation is playing out right now in California since Assembly Bill 319 was introduced. The bill would require that all single-use plastic bottles sold in California have the cap connected to the bottle. Connecting the cap to the bottle would allow the cap and bottle to be recycled together. This is significant, since 5 billion plastic caps from bottles are released to the environment every year in California alone, and bottle caps are the third most common item picked up during California’s annual Coastal Cleanup Day. Plastic caps litter streets, parks, inland waterways, beaches, and oceans, and harm wildlife who mistake them for food. "If you’re old enough to remember walking the beaches of Malibu or Coronado in the 1970s, you can vouch for what was then often the truth of beach life in California – stepping on pop-tops, the aluminum ring that came off after opening a can of soda," wrote Miriam Gordon, policy director at the UPSTREAM Policy Institute, in a recent op-ed for the Sacramento Bee. Gordon writes it’s useful to remember how pop-tops disappeared almost overnight when the beverage industry perfected a better way to seal aluminum cans: the stay-top, which remains attached and gets recycled along with the rest of the can. 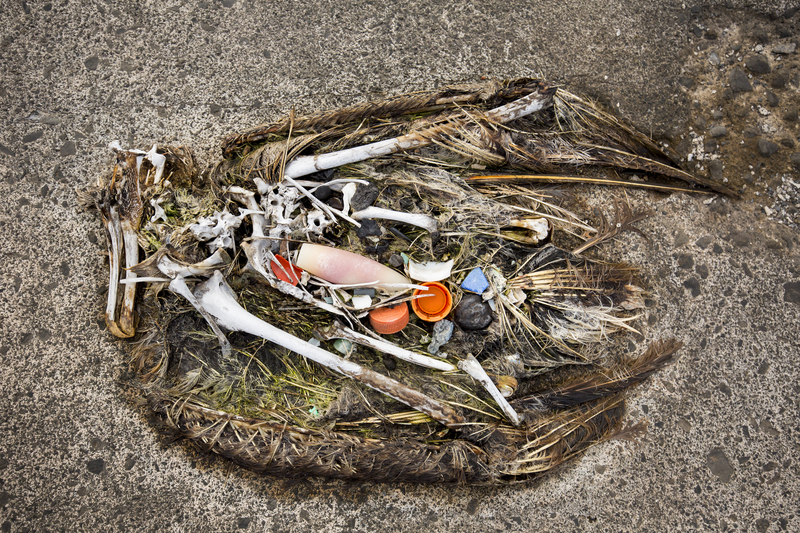 A dead albatross with plastic caps in its stomach. Photo by Tandem Stills + Motion. Experts note that connecting the cap to the bottle can be accomplished easily. "Making the switch can be accomplished by adding a small blade to current capping equipment that inserts a slit into the cap," wrote Paloma Aguirre and Trent Hodges in a recent piece for The San Diego Union Tribune. "Alternatively, since most bottlers replace capping machinery every few years anyway, a relatively quick transition to tethered caps could happen when equipment is being replaced." Some bottled water producers such as Crystal Geyser, are already offering their products with tethered caps, but many others have refused to voluntarily change. Gordon and other experts note that the bill would not only reduce pollution from plastic caps but would also help the state of California reach its 75 percent statewide recycling goal, since in-state plastic recyclers want plastic caps. The time is now to pass legislation like AB 319. With China's recent ban on plastic waste imports and plastic producers planning a massive scale-up over the coming decades, it's critical for government to take action to stop plastic pollution -- for the health of our environment, our waterways and oceans, and the animals too. Take Action: Tell your CA representative to connect the cap.